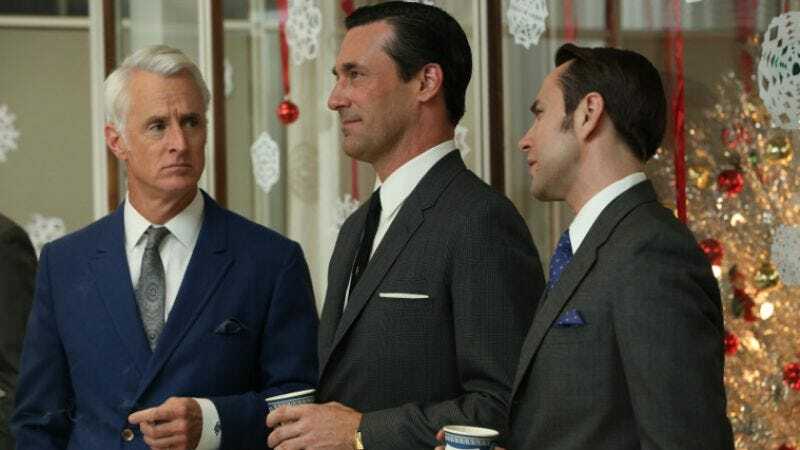 The return of Mad Men is only days full of baseless speculation away now, and today AMC has added a whole new batch of photos from the premiere to fuel that fire with a great big yule log, carved from the sturdiest of oak and the flimsiest of theories. Yes, it’s Christmas—a concept invented by men like Don Draper to sell stockings—and the entire firm is getting into the party spirit we’ve seen so many times before now: growing festive sideburns, smiling wanly at nothing, plastering chintzy decorations around the office that illustrate how much cheap artifice goes into creating the illusion of happiness and fulfillment. You “dream of a white Christmas,” but what you’re really doing is buying a product, packaged for you by Walgreens and Bing Crosby, etc. Even slipping into Hawaii at Christmas—the alter ego of the traditional holiday season—can’t make you whole. Because wherever you go, there you are. And there’s the bar for you to stare at morosely, the screams of your loud shirt turning ever more mocking. Perhaps indulging in the contemporary fads of hideous sportcoats and potions that transform you into giants can briefly bring you joy. Or perhaps a man who grows 10 sizes larger in an instant only feels 10 times as empty. Also, Sally Draper is probably going to murder someone. Merry Christmas.